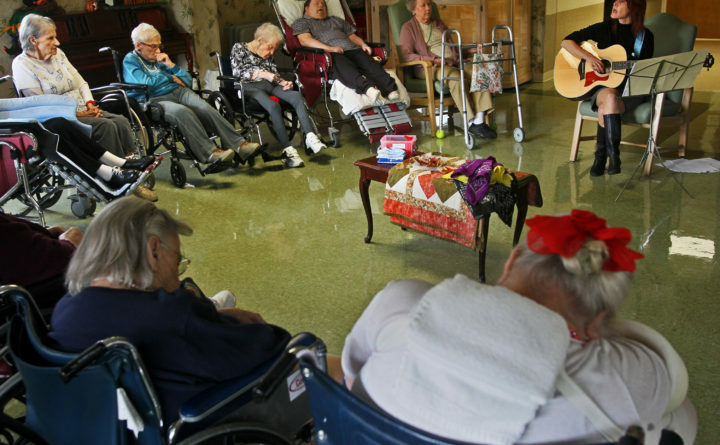 Licensed music therapist Kathy Lindberg (top right) leads residents at the Pleasant View Health Care Center in a variety of songs in Barberton, Ohio, Oct. 10, 2012. A couple days after Maine voters rejected a tax increase to fund universal home care, a new study found that long-term care costs in the state rose during the past year, with the cost of both homemaker and home health aide services showing the highest increases. The state’s home health aide services costs rose 10.64 percent from 2017 to 2018. The median annual cost was to $59,488. That’s far higher than the 2.33 percent rise to $50,336 nationally during the same one-year period. Nationally, the cost for home health aide services has risen 19 percent from $42,168 in 2004. The monthly cost of a home health aide was $4,576 in Penobscot County, including Bangor; $5,005 in Androscoggin County, including Lewiston and Auburn; and $5,339 in Cumberland, Sagadahoc and York counties, including Portland. The service costs $4,576 in the remaining Maine counties. The figures are from the 15th annual Genworth Cost of Care Survey conducted by its related company, CareScout of Waltham, Massachusetts. Genworth Financial is an insurance holding company based in Richmond, Virginia. Findings were released Thursday. More than 15,500 surveys were completed of nursing homes, assisted living facilities, adult day health facilities and home care providers. The survey includes 440 regions based on the Metropolitan Statistical Areas defined by the Office of Management and Budget and includes approximately 85 percent of the U.S. population. Maine’s homemaker care services also rose 8.7 percent over the past year to a median cost of $57,200, compared with 0.24 percent nationally to $48,048, which is up 26 percent from the $38,095 in 2004. Adult day care costs in Maine rose 1.85 percent to $28,600, assisted living was up 1.23 percent to $59,400, a semi-private room in a nursing home was up 3.16 percent to $113,150 and a private room in a nursing home was up 3.43 percent to $121,180. The cost increases locally and nationally are concerning, Genworth said. People are living longer and the average of all costs to care for them rose 3 percent from 2017 to 2018, and in some cases, care costs rose two to three times the 2.1 percent U.S. inflation rate. Several factors are driving up the cost of care, according to th Genworth survey. They include the shortage of skilled workers and the overtime pay that can result from that. Difficulty attracting and retaining qualified workers is another factor. Also figuring into the costs are business constraints facing home care agencies, such as differing laws on certification of caregivers, compliance obligations, razor-thin margins and balancing care quality and costs, according to Genworth. Other factors include the increasing incidence of Alzheimer’s disease and dementia, which is increasing the need for more specialized care; higher hourly wages; and aging Americans needing more specialized care, as a result of waiting too long to receive professional care.